The first flag of the Comoros was flown from 1975-1978. It had a red horizontal stripe taking up half the flag with a green stripe at the bottom. On the top left corner is a white crescent moon and four stars with five points in a square formation. From 1978-1992 a green flag with the moon in the center and the stars in a line to the right of it was used. From 1992-1996 the flag remained green but the moon changed its position and looked like the letter U. The stars were in a line above it. From 1996-2001 the moon was upright and took up the center of the flag; the stars were in a line to the right of it there was writing in the top right corner and left lower corner. In 2001 the flag changed dramatically. It has four horizontal stripes; yellow, white, red, and blue. There is a green triangle extending to the center with the moon and stars within it. This is the flag that is flown today. 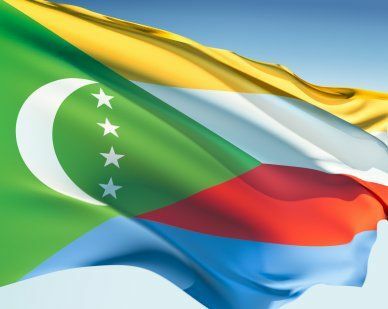 Our top-quality Comoros flags conform to all official specifications. Emblems and designs are executed with the highest possible degree of accuracy in regard to detail, color shades, placement and proportion to flag size.